The MTA Board on Wednesday approved funding for a third track on the Long Island Rail Road’s bottlenecked Main Line. The proposed $2 billion LIRR Main Line Expansion project, to build a 9.8-mile third track between Floral Park and Hicksville, was one of several to be funded through a board vote that increased the Metropolitan Transportation Authority’s $29.5 billion capital plan to $32.5 billion by assuming an additional $1.6 billion in debt. The project is set to begin later this year, and officials have said they expect construction to last three to four years. State and MTA project officials say it would ease the commutes of a half-million LIRR customers daily. Also on Wednesday, Ferrer said the LIRR’s plan for handling service disruptions during Amtrak’s proposed track outages for infrastructure repairs at Penn Station from July 4 until Labor Day would be released soon. ‘‘We are still examining the impact of what we understand from Amtrak on our Long Island riders,’’ he said. ‘‘We’ll be ready to come out with that—including responding to Amtrak’s request for track space at Grand Central—in the next few days,’’ he said, noting that commuters would be informed well before they have to make plans for the summer renewal project at the aging Manhattan rail hub. ‘‘We’ll be redirecting some trains away from Penn towards areas where [passengers] can disembark and get on our subway system — and cross-honoring tickets—we’re doing all of that,’’ Ferrer said. 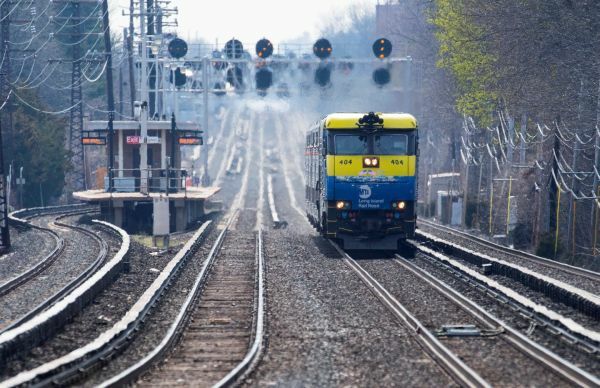 Critics of the third track plan including elected officials from New Hyde Park and Floral Park, have questioned the need for the project and suggested other improvements, such as additional switch points between the two existing Main Line tracks, would accomplish the same benefits with less impact. Currently, a train breakdown can hobble the Main Line, according to David Kapell, executive director of the Right Track for Long Island Coalition. Giving trains an option to travel around it will be a boon for current LIRR riders and expand opportunities for reverse and inter-Island commuters, he said. In April, the LIRR issued a final environmental impact statement for the project, which will include the elimination of seven street-level grade crossings. “Expanding the Main Line is crucial to the future success of Long Island businesses and its residents, and this environmental study brings us one step closer to fulfilling New York’s goal of providing reliable, safe travel for all,” Gov. Andrew M. Cuomo has said. After years of planning, the LIRR abandoned its third track plan in 2008 amid local opposition, including by residents concerned that the project would require encroaching on homes. In January 2016, Cuomo resurrected the plan, promising to make it more acceptable for affected communities, including by not building on private, residential properties and by addressing grade crossing concerns.